ever since traveling to Mexico for our honeymoon do-over (a long story involving my non US citizen of a brand new hubbs who did NOT update his Yugoslavian passport, and was therefore threatened with deportation at the airport the morning we were supposed to leave for Playa del Carmen, leaving us to then go to Disneyworld for a week instead, thus taking the Mexico trip on our 1 year anniversary.....) I've been OBSESSED with authentic mexican food. And 100% COMPLETELY UTTERLY BITTERLY disappointed in anything less. like the "mexican" food that has the same 3 ingredients in every dish they offer- greasy meat, some sort of tortilla, and a crap ton of nasty cheese. NOT MEXICAN FOOD, PEOPLE. Suffice it to say, unless you spend a LOT of money here, you're not getting authentic Mexican. which is hilarious, because in Mexico, the best food is typically found on a random street corner food cart for very very cheap. We rediscovered our love for it on our 5 year anniversary trip to Cabo, where babygirl was conceived. I am convinced that is why Mexican food is her favorite. So I decided to make it my mission to simply cook the best Mexican food in the area. And I think I do. but finding the right recipes was a bit of a challenge. I've already given you the yummiest refried bean recipe. And now, I'll share with you my findings on the best meat possibly on the planet. 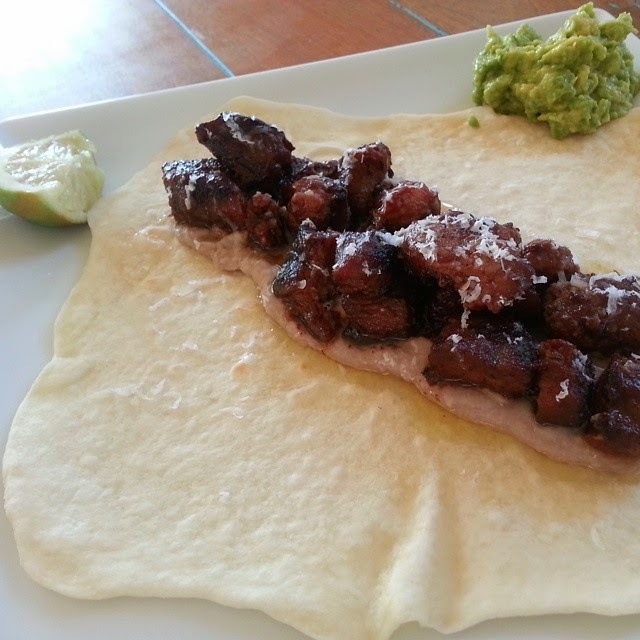 Pork Carnitas. Here's what I learned after cooking this recipe twice. First, use lard. Just use it. Don't be all "but it's so fattening" about it. I can promise you that anything else you use will either a) taste like garbage b) wreak havoc on your system or c) both. Second, the first time I made this, I simmered it on the stovetop for the hour and a half it says to, tasted it, and it was AMAZING. Then, I put it in the oven like it says to to finish it off. And it dried out a bit. It was still delicious, but just a teeny bit less so than before it was put in the oven. Which bummed me right out. So moral of the story? Totally cook it this way. And of course, you must have the accompaniments to the carnitas. So. For the bomb guacamole, here's what we do. We cut up some onion and put it in our dedicated awesome guacamole maker (it's a mortar and pestle). throw some sea salt on them and grind those bad boys up, getting the onion juice out and pulpy. then throw in some avocado and some lime juice. then start mashing. Done and done. Seriously. It's the yummiest way to make guacamole, takes about 2 seconds, and between the lime juice and sticking an avocado pit in it, it will stay green for that night and usually the next day. that big old gray thing is obvs our guacamole bowl maker. 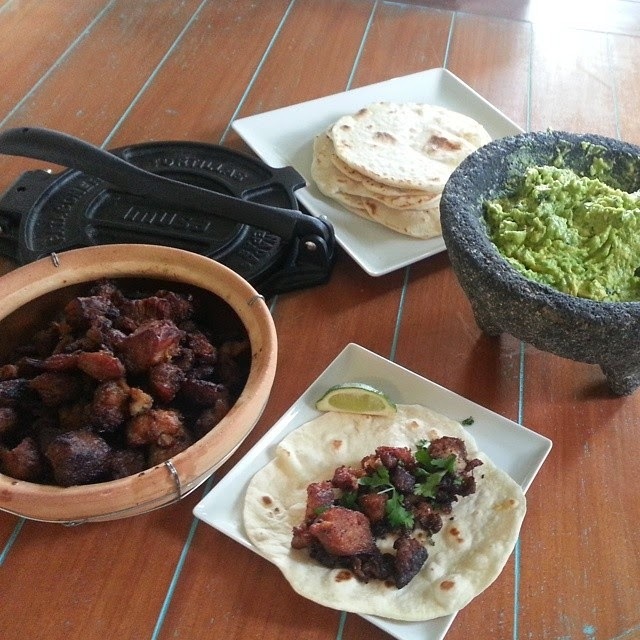 And truth- this is the first time I made the carnitas...I didn't take a pic of the guac this past time. And of course, no good mexican dish is complete without the tortillas. I have a hard time eating store bought tortillas anymore, because homemade are a zillion times tastier. And they're not hard to put together. A little time consuming for the actual cooking of them- one at a time in a cast iron skillet. But worth it. We make a ton, end up freezing some, and then they last for 2 or so weeks. I have no idea if they last past 2 weeks....we've never made it that long. And more truth. I've had a specific recipe that we've used for years now. They're delicious. 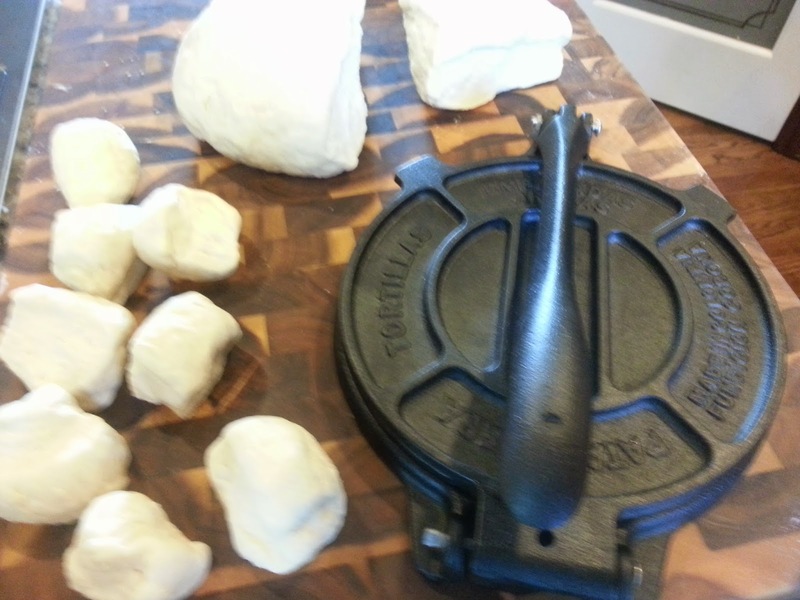 But we bought this tortillas press, and it simply doesn't work without also having to roll out the dough. Which is beyond frustrating. 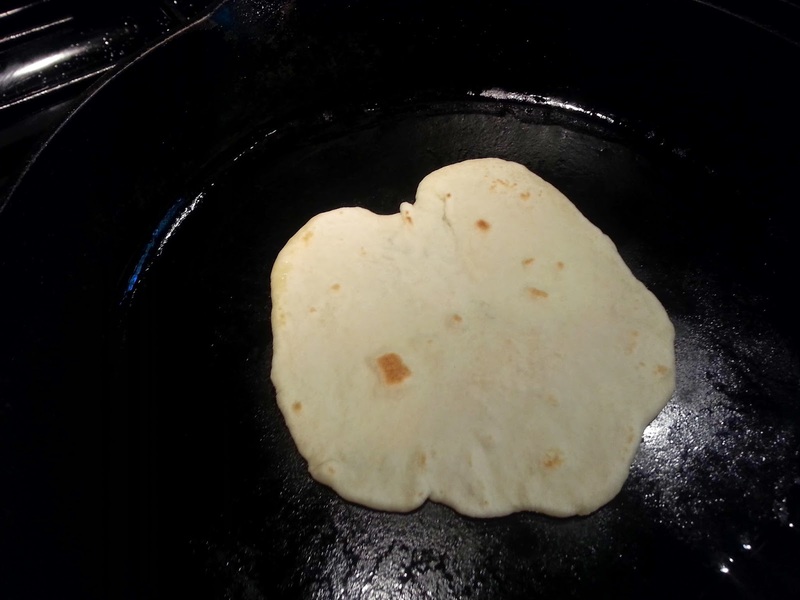 So this time, after I had already made the dough, I looked online for some tips on how to make flour tortillas and successfully use the press. And I stumbled on a recipe that calls for more lard and less flour. which totally makes sense, since the press doesn't work because the dough just shrinks back as soon as you take it out of the press. So I am including the new recipe here. And use lard, again. Crisco is disgusting. And the lard makes the difference. I have used butter in the past when I didn't have any lard and they are still yummy, but there is definitely a difference. So you just stick each one in the press and then cook it in your cast iron skillet. I don't think you need salsa or sour cream for these. Hubbs disagrees. He uses salsa and sour cream on all forms of his Mexican food. He's wrong, but whatevs. You do however definitely want to grate some cotija over the top. Parmesan's Mexican cousin, this cheese is amazeballs and should be the only cheese you use on Mexican food, ever. While, queso fresco is also delicious, but I really don't enjoy that sort of cheese on my tacos or burritos. Cotija it is! And this time, I put some refried beans on mine cause they came out extra yummy so I had to. And there you have it. Carnitas for days. And it really is so simple to put it together. They tell you how you can do it in the crock pot, but I loathe those things, so I didn't use that. But if that's your jam, then you totally can do that. Any way you slice it, this is the best way to eat pork ever ever.